Neoprene knee braces are one of the most popular types of knee brace on the market. Like all braces they provide good support to the knee joint reducing pain and instability. The added advantage of the neoprene material is that it retains heat, which helps promote healing and reduces swelling and pain. Neoprene is the best material out there at retaining heat and insulating. Neoprene is made from synthetic rubber and is commonly used in wetsuits. It works by preventing heat from escaping, thus trapping the heat next to your body, even during periods of inactivity. This increases the blood flow to the knee which promotes healing. The downside of neoprene knee braces is that they can cause a build-up of sweat as the heat and moisture stay next to the body rather than evaporating away and cooling you down. There are a whole range of different neoprene knee braces out there offering different levels of support. The best place to start is to work out what level of support and protection you need from a knee brace and then choose a style of brace. Elite Level: for moderate to severe injuries, instability and pain. Provide maximum stability to prevent giving way. Some braces can be locked to restrict movement if require. Here we will look at the best neoprene knee braces on the market, compare models, look at the pros and cons of the different styles available and how to choose the right size for you. These neoprene knee braces provide basic protection for ongoing knee conditions and/or minor injuries and instabilities that require a low level of support and are perfect for mild knee pain, sprains, weakness, arthritis, cartilage irritation and knee swelling. They are not suitable for moderate to severe instability and pain – in these cases you need advanced or elite protection. For more options visit the basic knee supports section. Overview: This Neo G neoprene knee brace improves stability by eliminating unwanted gliding and twisting at the knee. The brace distributes weight bearing pressure more evenly over the joint, which helps ease arthritis and meniscus pain. It features a patella opening with a stitched buttress giving reinforced support to the patella and anterior knee. My verdict: A good, simple yet effective neoprene knee brace. 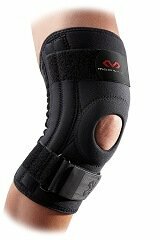 I personally prefer open patella knee braces like this as they give better support to the kneecap without putting pressure through it. They also allow the knee to breathe better so you get less sweaty, which can be a problem a problem with neoprene braces. Average user rating 4.4/5. Overview: This neoprene knee brace provides compression, support and warming relief to the entire knee complex without restricting movement. It is only 2.5mm thick so can easily be worn under your clothes, providing dynamic support whilst still allowing full range of motion in all directions. My verdict: This neoprene knee brace provides good basic level support stays in place well, unlike many other knee braces. Reviews are extremely positive however if you have problems with your kneecap, a sleeve with a hole at the front for the kneecap may suit you better. Average user rating 4.3/5. My verdict: This is the cheapest basic neoprene knee brace. People report that is very comfy even when worn all day. It comes in a reversible black/red. Average user rating 4.1/5. Advanced braces have inbuilt supports to provide targeted support where needed and reduce the forces going through the kneecap by improve patellar tracking (how the kneecap moves). They provide moderate levels of support and reduce the forces through the knee for mild-moderate knee injuries, instability and pain. For more options visit the advanced knee brace section. Overview: This neoprene knee brace provides great support and compression, and has metal spiral support stays to stabilise the knee whilst allowing controlled movement. It is particularly good for sports. The open patella area helps reduce pain associated with patella tracking problems, and offers relief from bursitis. It has three adjustable straps which allow variable compression and ensure a custom fit around the entire knee complex. My verdict: This is one of the best neoprene knee braces on the market offering advanced support and protection. 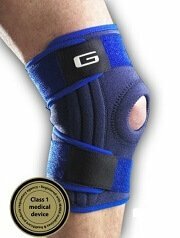 It is very reasonably priced and it proves that knee braces don’t have to be cumbersome to give great support. Average user rating 4.3/5. 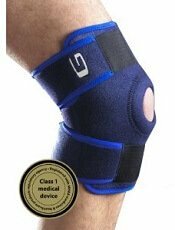 Overview: This is one of the most popular McDavid knee braces for a number of knee problems including ligament and cartilage injuries and also helps relieve the symptoms of chondromalacia, patellar subluxation and patellar tendonitis. It has special supportive steel springs that strengthen the brace on either side of the knee joint to improve stability and support knee ligaments so is perfect if your knee is feeling slightly unstable. My verdict: This brace is a classic design and it is rated highly by users. If you are looking to get a bit more support than a pull up design, it is well worth the money. Average user rating 4.1/5. Knee straps are simple but extremely effective, and people often can’t believe how such a small strap makes such a difference to their knee pain. They are particularly good for conditions such as ITBS and patellar tendonitis. For other options visit the knee straps section. 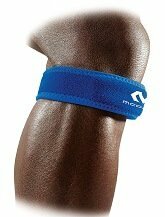 Overview: The McDavid knee strap reduces pain caused by patellar tendonitis (jumpers knee), Osgood Schlatters, Chondromalacia Patella, and Runners Knee. 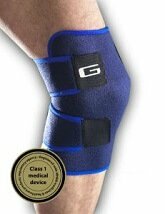 It is also good for general anterior knee pain around the kneecap. 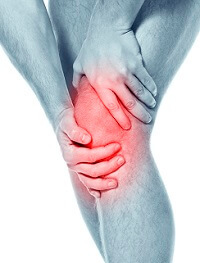 It reduces forces going through the patella tendon due to a unique tubular buttress which applies constant, mild compression on the patellar tendon. It is perfect for people who do lots of running and/or jumping. Fully adjustable Velcro for perfect fit – one size fits all. Elite knee braces are the ultimate in protection. They are designed to provide the maximum level of support for moderate to severe knee pain and instability. They use a combination of splints and hinges to help provide support and prevent further injury. Elite braces are perfect for knees that repeatedly gives way due to moderate to severe injuries and pain e.g. ACL tears or following knee surgery. 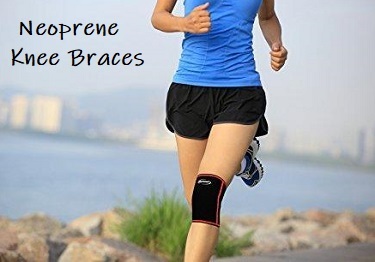 For other braces in the category visit the elite knee brace section. 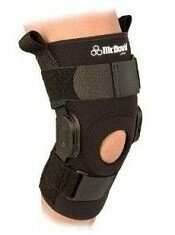 Overview: This brace is designed for moderate to severe knee instability and pain after knee injuries e.g. ligament and cartilage tears. It is also suitable for knee arthritis. It has two side hinges that prevent hyperextension (knee bending too far back), and rigid uprights providing additional sideways support whilst allowing freedom of movement. Tis neoprene sleeve has a seamless, breathable back panel for improved comfort. Patellar support buttress helps improve patellar tracking (how the kneecap moves). Fully adjustable Velcro straps ensure a perfect fit for your knee. My verdict: This is my favourite elite neoprene knee brace on the market as it offers great protection at a very reasonable price. Users consistently give it good reviews because it is easy to apply, comfortable and effective. Average user rating 4.2/5. 1)	Pull Up Sleeves: Easy to use and apply, these will provide some support and warmth to your knee. Perfect for people who get niggles when doing activities. These are generally the cheapest types of knee support. Great to have in the cupboard for those inevitable knocks! They come in a variety of sizes. 2)	Wrap Around Braces: You can adjust these to fit your knee perfectly so they tend to stay in place better than pull up ones. They work well to accommodate any fluctuations in knee size with swelling. One size fits most. 3)	Open or Closed Style: Some have a hole at the front for the knee cap (putting less pressure through it and allowing the knee to breathe) while others are closed supporting the entire knee (allowing more heat retention). Choosing a knee brace can be difficult, especially as there are so many different braces on the market. Neoprene knee braces are just one of the options out there. To find the best knee brace for you, visit the Knee Brace Guide to find out about the different styles of brace available, what conditions they are suitable, and which ones get the best reviews from users. Safety Advice: Some neoprene braces contain latex. Where braces come in more than one size, it is important to get the right one otherwise they won’t work effectively and may be very uncomfortable. Measure around the widest part of the knee and choose from the options below. If your knee size falls between two sizes, it is usually best to go for the larger size for a better fit.